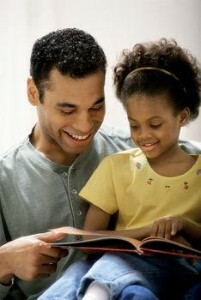 Fathers who use their parenting skills to help their child read at an early age may be assisting their son or daughter’s cognitive development more than they realize, according to one study. Researchers from the University of Leicester have found that a child’s early reading experiences may be critical to the development of their lifelong reading skills. Furthermore, the study found the age at which a child learns words is key to understanding how they will read later in their life. "Children read differently from adults, but as they grow older, they develop the same reading patterns," said Dr Tessa Webb from the school of psychology at the university. "When adults read words they learned when they were younger, they recognize them faster and more accurately than those they learned later in life." Webb examined children from three schools and found that by the age of 10, children were mimicking the reading pattern of adults. The doctor’s research may give fathers more incentive to read to their young children every day, a practice the National Children’s Reading Foundation recommends taking part in for at least for 20 minutes a day.